The Gray House could not provide the services we do without the support or our dedicated volunteers. Ken Perreault, one of the Adult Education Teaching Assistants at The Gray House agreed to be interviewed about his volunteer experience. What brought you to the Gray House? I am all about helping people. Growing up the way I did, with people teasing me because of my disabilities, I know what it’s like to be left out and on the side lines. I realize that refugees and migrants must also feel relegated and left out because they don’t know the language. I went to the Gray House website because I was looking for something worthwhile to do … and I am a teacher who wanted to teach again. What does assisting in the Adult Education classroom bring to you? It brings me joy and friendship. I am helping marginalized people feel that they belong. 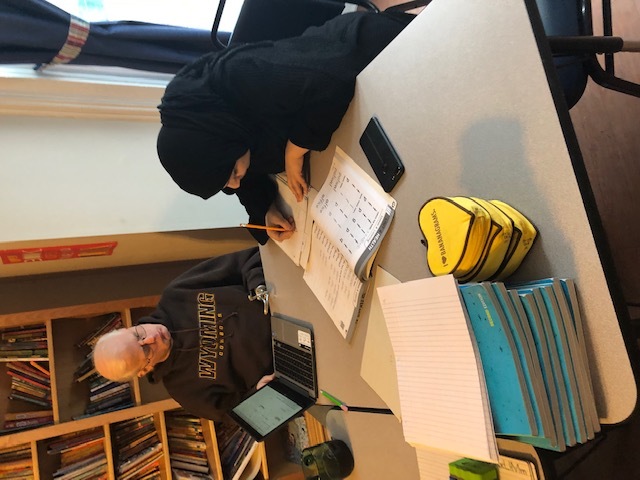 Gaining the ability to read, write and speak English not only gives them a sense of belonging, but also invites them to be part of a larger community. The Gray House is a multi-ethnic and multicultural family for me, and I am a part of that family. What have you accomplished in your short time at the Gray House? I was placed as a volunteer tutor at the Literacy level where people are learning to read, write and pronounce. Not being literate … even in their own language … has held them back from fitting in and surviving. I have seen several of the people I work with blossom as they grow. Adults who have been in a constant state of gray … clothing, facial expressions, and outlook on life … have seen the sun come out. They are smiling, laughing and wearing bright colors. What are you looking forward to in the future at the Gray House? If you’re interested in making the 12-week commitment to volunteer as a teaching assistant in Adult Education at The Gray House, the next tutor training seminar will be Tuesday, February 5 from 10:00 AM to 12:00 PM at The Gray House.